FC Barcelona secured their place in the Semi-Final of the Copa Del Rey with a sensational 3-2 victory against Atletico Madrid. Barca had to come from behind twice in a sensational first half which saw five goals beings scored at rather frightening pace. Neymar was Barca's star performer scoring twice and the other goal coming from an own goal from Miranda. The match was a fiery affair not only interms of football but also in terms of general conduct. At times the conduct of Simeone's boys were really bad with Turan even finding time to throw his boot at the linesman. But the disgraceful fact was that the referee didn't sent him off for such a big offense. What kind of signal is the RFEF trying to send to the players. This is really bad by the referees and what makes it worse is that it follows the relatively kind two match suspension handed over to Ronaldo for punching, kick and slapping the opponent. The referees needs to get their acts together otherwise considering the history of the clubs in Spain and it's own history, it will soon end up with widespread riots on the streets. 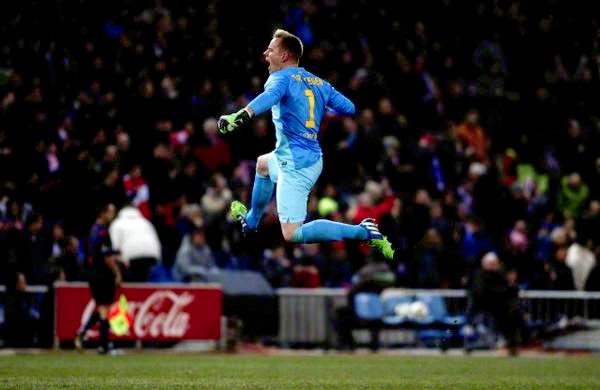 FC Barcelona took a firm step towards Copa Del Rey Semi-Final when they beat Atletico Madrid 1-0 at home. The victory came via a Messi penalty (technically can't be called a penalty goal as his penalty was blocked and he scored from the rebound). The penalty was awarded when Busquets was brought down in the box following a Messi free kick; some could argue that the penalty was a bit soft. But there is no denial that there was contact. The match was a real tight one unlike the recent La Liga encounter between these two teams. Barca should be happy with the way they kept Atletico attack safely isolated. The chances were at premium and the best one fell once again to Saurez who as we seen many time in recent past blasted over. FC Barcelona consolidated their second position on table with a comfortable victory over defending Champions Atletico Madrid at the Camp Nou last night. The victory came courtesy of goals from our froward trio of Saurez, Neymar and Messi. Messi, who has been the subject matter of all discussion related to Barca in recent weeks produced a marvellous performance. He played an enormous role in all goals that Camnp Nou saw last night, even the one which we conceded through penalty. 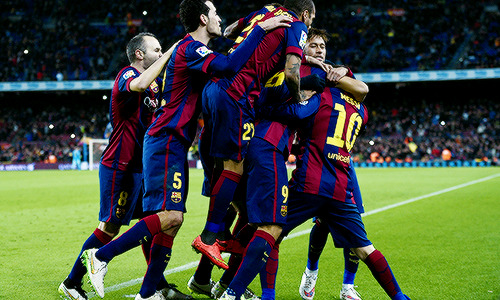 Even though there is a second leg to be played away from home; Barca's 5-0 victory at home made that just a formality. With the stunning display and result of 5-0, Barca has virtually secured a Quarter Final spot in this season's Copa Del Rey Competition. 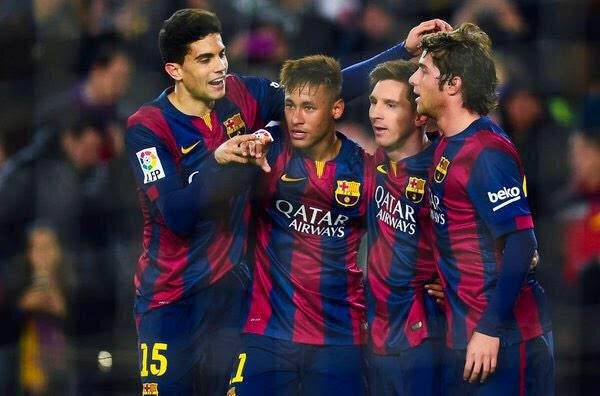 Barca's Quarter final opponent will be one of the big team from Madrid, either Real Madrid or Atletico Madrid. Atletico looks favourite to face Barca after they defeated Real Madrid 2-0 at home. 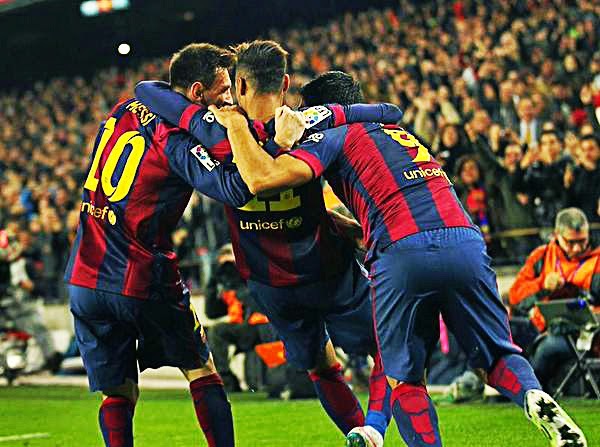 The victory against Elche has been Barca's first of 2015 and let's hope the winning streak continues. Enjoy the Highlights. The fact that Andoni Zubizarreta managed to stay as FC Barcelona's Director of Football was the biggest joke played on the fans for sometime. Some may argue that the board itself is a bigger joke, we will come to that later! This didn't come as a surprise to many. From the time we went to CAS fro appeal against transfer ban, there were hints that Andoni Zubizarreta would be made a scapegoat if the decision went against the club. The decision went against us and we have our Official Scapegoat. The Board members clearly knows that sacking him helps them to stick to their job for more time, a job for which they have no respect. I am not arguing that Zubizarreta should not have been sacked, I believed firmly that he should have been sacked long ago (Does Andoni Zubizarreta deserves to be Barca's Sporting Director?). I have argued for his sacking a year ago. He was the biggest joke played on Barca fans for sometime. No one had been rewarded like him for simply "Sleeping on the Job" in the history of the Club or even Football in general.